What a great question, and it deserves a stronger answer than I can give through a simple email reply. I don’t always have consistency in my work because I have so many interests between realism and impressionism. Quality with our work is the most important consideration and that simply comes from study and mileage – lots of paint strokes. However, if we’re concerned about selling, especially through galleries, then developing a consistent look and direction in our work can be helpful. At the same time, if we follow our instincts, eventually our personality and experiences will come out in our work and create a consistent theme or recognizable ‘look’. Two very different artists come to mind – Robert Moore and Quang Ho. I first saw Moore’s work in the 80’s at Trailside Galleries – he paints pretty much the same subjects and style today and he sells like crazy. Several people have studied with him and paint quite a bit like him – they also seem to sell well. He is color blind and relies on values – proving that if we get the values right, we can use about any color. Robert does vary his subjects occasionally, throwing in some animals, figures, flowers, and flags. Quang Ho also sells his work easily and has done so for almost 3 decades. His painting style and approach, while consistently high in quality, will show some major experimentation and divergence from one moment to another. He is always trying to push his skills and understanding to a higher level and he tries new techniques or ideas often. Notice how he will jump from more tightly painted realism like these spring flowers to a barely discernible expressionistic ocean surf. He will wander from depth-filled landscapes to flat, poster-like oriental still-lifes. His subjects cover animals, figures, flowers, buildings, dancers, creeks, commercial kitchens and anything else that grabs his attention. In other words, while a consistent ‘style’ or ‘look’ is often helpful for targeting a specific group of collectors, consistently high-quality work can also overcome being pigeon-holed. Morgan Weistling is another fantastic artist. His style is very much his own. He has been painting variations of pioneer living for about 20 years in a reliable and quickly recognizable style while keeping his quality extremely high. His paintings are some of the most sought after in western art. Peter Fiore, one of our popular Blank Canvas artists, works in series – such as his lively The Tangle series. His use of saturated color and dramatic lighting, coupled with lots of painterly shifts and textured brushstrokes are unmistakably his own. Most successfully-selling artists I know paint with a distinct or recognizable look that they developed over years and lifetimes of painting. 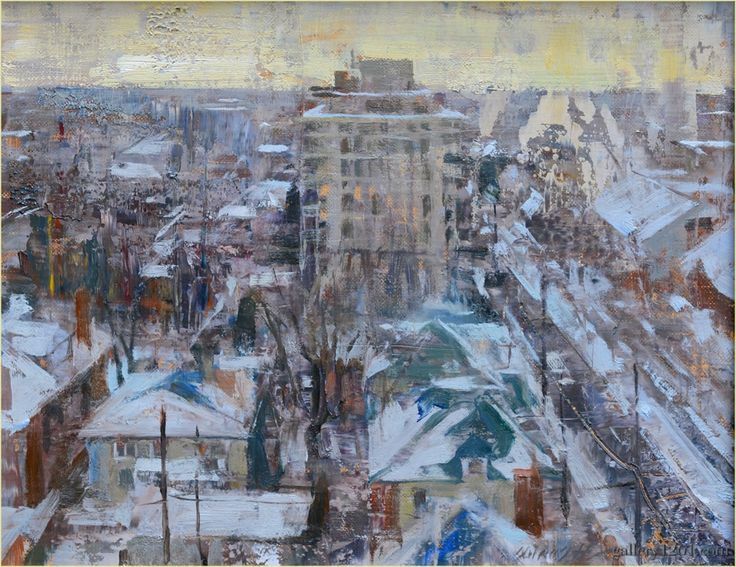 Richard Schmid, Clark Hullings, George Hallmark, Brent Cotton, William Hook, Walt Gonske, Scott Christensen, Bob Kuhn, James Reynolds, Brian Blood, Daniel Pinkham, Jeremy Lipking, Douglas Fryer – there’s a lot more out there, but that gives you an idea of the varied styles among artists who sell well. When you see their work, you know right off who the artist is. My work has also sold readily over the years despite the lack of any real effort put into promotion and marketing. Before turning much of my focus on teaching through Master Oil Painting I would show my work in 5-6 galleries at a time. The galleries were usually located in strong art markets like Santa Fe, Colorado, Texas, and Jackson Hole, Wyoming. I did a lot of experimenting and pushing the boundaries of my skills which resulted in multiple transitions with my style. I also tried to keep my prices comparatively low. I wasn’t really business minded – I just loved painting and was blessed with great galleries who were patient with my experimentation. Ok, so there’s not really a true formula for much of anything in the arts. But there are some similarities between successful artists worth taking a serious look at. Remember, mastering painting is an incredible journey. It’s supposed to be fun and challenging all at the same time. If you don’t care about selling your art, then consistency in style or approach might not benefit your painting. Then again, even if you aren’t worried about sales, consistency can assist your progress because it helps you to see changes, good or bad, in quality, technique, and expression. Go for it and have fun discovering your distinctly-you approach to art. PreviousCan You Mix Different Paint Brands? What a great article. Encouraging and challenging. Thank you Ursula, I’m so glad to hear you found it helpful! I am a “Jack of All Trades….” and didn’t find painting untiI I retired several years ago. As a hobby I took lessons in drawing, water colour and later tried water based oils. I managed to produce a few acceptable paintings and became fascinated. Struggling with modern technology I found you. Now I have the time and the passion to learn but not the years! I am 95. However Bill I am grateful to you and the Almighty. I look forward to every Blog from Blanc Canvas and continue to enjoy being a Member and paint. I also feel I have found a new friend. Thank you so much. Wow, I am honored to be a part of your art journey Rosemary! Thank you for the kind words and I am so glad to hear that what we do here has been a joy to you. I’m grateful to be your friend as well. Thank you for these helpful points at developing as an artist. I will print them up and have the reminders readily available in my studio. I also enjoyed seeing the various artist’s work, including how you have evolved in your art. At the risk of appearing nit picky I noticed that all the artists you chose were males. I’m guessing this may have been happenstance, but, thought I would ask you about it. I know, traditionally, there have been more well known male artists. No risk at all Shirley – that’s a perfectly legitimate observation! There are several female artists I admire, these in this blog post were simply artists that came immediately to mind who’s paintings sell readily. If you look at our Blank Canvas series you will notice that Bonnie Marris was one of the first. I wish she had come to mind because she is a very popular artist with collectors. I have loved her paintings since the late 80’s. Camille Przewodek, Sherrie McGraw, JoeAnna Arnett, Carrie Ballantyne, Carolyn Anderson, Jenness Cortez, Kathleen Dunphy, Laura Robb, Katie O’Hagan, – all highly successful and wonderful artists. We recently did a Blank Canvas interview with Susan Lyon as well. Two of my favorite artists growing up were Mary Cassatt and Berthe Morisot – seeing Little Girl in a Blue Armchair was one of the highlights of my trip to the National Gallery of Art. Unfortunately most of the coffee table books are still written about male artists. I have a couple books on Mary Cassatt, but most of my art books were written by or about male artists. The world is changing and more and more is being written about female artists, especially contemporary ones, but it is still a slow and biased situation. Sorry for omitting female artists. I study the work of many, but I’m still not as familiar with most as I am with those male artists I have admired for 20 or 30 years. It sounds like a blog post devoted to some of the outstanding female artists’ paintings that I study or follow would be a fun topic. Let me know if you have any you would love to see us interview or write about as well.